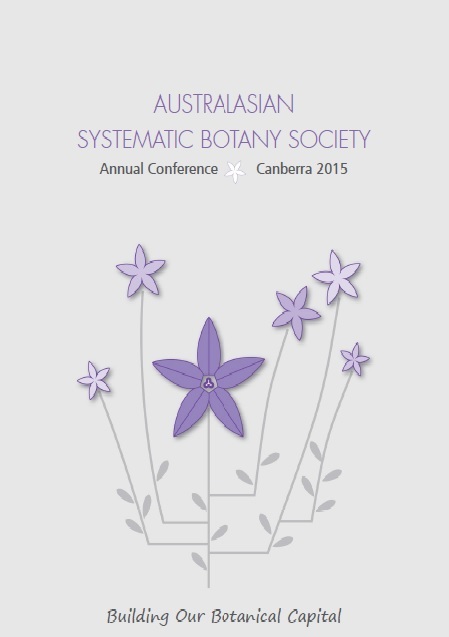 Chief Botanist Michelle Waycott, State Herbarium staff members Ed Biffin, Juergen Kellermann & Ainsley Calladine, and Herbarium Honorary Research Associates Robyn & Bill Barker attended the Annual Conference of the Australasian Systematic Botany Society (ASBS) in Canberra last week (30 Nov.-2 Dec. 2015). Presentations were given by Ed (on molecular systematics and species identification in seagrasses), Robyn (on problems with old type specimens) and Michelle (on the South Australian eFlora platform). In addition, Michelle presented the current status of the national work towards the development of a decadal plan for systematics research in Australasia (ASBS Newsl. article, 3.3MB PDF). Bill Barker completed his tenure as President of ASBS, his work for the Society was greatly appreciated. The conference had strong themes in digitisation, data sharing and initiatives to facilitate working across Australia and New Zealand including the development of a new electronic Flora application by the Atlas of Living Australia (ALA). PhyloLink, a new application in ALA was launched during the conference and delegates were able to attend a PhyloLink workshop following the conference (Juergen attended that workshop). Scott Edwards from Harvard University‘s Museum of Comparative Zoology presented a workshop on phylogenomic analyses, which was attended by Michelle and Ed. The program booklet, including abstracts of all talks, can be downloaded here (460KB PDF). This entry was posted in News on 11 December, 2015 by Jürgen.